Deep diving is for very experienced divers only, but divers of all abilities should be aware of the dangerous and sometimes frightening effect that water under pressure has on their bodies. The inert nitrogen in the air that we breathe when we are under pressure has a narcotic effect known as nitrogen narcosis. Jacques Cousteau called it ‘the rapture of the deep’. Nitrogen narcosis affects people in many different ways. Some people become euphoric when at depth, whereas others become paranoid, and some even experience both emotions. Not much research has been done on the subject of nitrogen narcosis. Scuba diving training agency manuals often liken the effect of nitrogen to that of alcohol – the deeper you go in the water, the more ‘drunk’ you get. Some people seem to be unaffected and can complete complex tasks at 50 m (160 feet), whereas other divers become incompetent at only 15 m (50 feet) deep. It is believed that the nitrogen we absorb affects the transmission of information within our nervous system. This probably explains why experienced divers seem not to experience nitrogen narcosis, whereas new divers often do. The bodies of experienced divers have adapted to cope with the effects of nitrogen, just as hardened drinkers are apparently able to tolerate higher levels of alcohol than moderate drinkers. Some divers start to act irresponsibly at depth, whereas others become overcautious or even fearful. 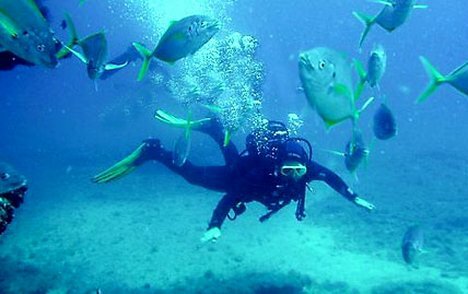 In difficult conditions, such as low visibility, the effect of nitrogen narcosis appears to increase. The dangers of nitrogen narcosis mean that you should never go to depths that you are not used to. When you are training to go deeper, you should always be escorted by someone with plenty of experience. You should never go deeper than your certification allows. At depth, you also start absorbing nitrogen quicker than you would in the shallows. The no-stop diving times beyond 25 m (80 feet) are quite short, and it’s easy to stay underwater too long. A deep dive needs to be planned carefully so that the no-stop time is adhered to. If it is not, you will have to make staged decompression stops at points during the ascent. The first mandatory stop you will see on your computer display will be at 3 m (10 feet), but if you stay deeper longer, you may have to make stops at 6 m (20 feet), 9 m (30 feet) and even 12 m (40 feet), too. Air doesn’t last as long at depth, so you need to be sure to take enough with you to make the slow ascent required. This may mean being equipped with a larger tank or even more than one tank. If you dive deep at the beginning of a dive and then slowly make your way back up the reef, you are doing what is called a multilevel’ dive. This gives your body enough time to shed the nitrogen that it has absorbed naturally. Your diving computer recalculates your decompression obligation as you go. Take your time but manage your air so that you have plenty left in the shallows. A long time spent at less than 9 m (30 feet) deep makes your ascent even safer. It is important not to forget the safety stop at 5 m (15 feet).